Applying her new-found skills baking small batches at home, within a year Karma Bread had grown large enough to warrant its own premises. 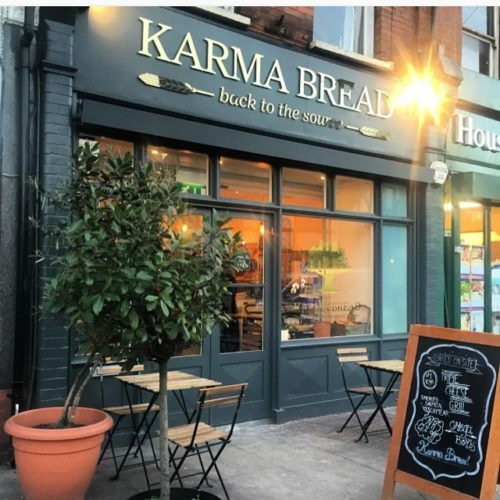 Nestled in leafy Hampstead on South End Green, the minute you walk into Karma Bread you know you want to take a piece of it home with you. The shelves groan with hand crafted sourdough bread, pastries, babkah (a sweet twisted dough with cinnamon or chocolate), iced cinnamon buns and Tami’s famous challah bread every weekend. Doughnuts come out at the weekend too and they are very highly regarded! The three cheese grilled sandwich is a much talked about item and there is also a homemade soup of the day. Pop in for a coffee and a pastry, linger longer over a sandwich or pick up a few baked goodies to take home – you know you want to!